Six Days in Fallujah Bad, "Family Friendly" Wii Shooter Good! 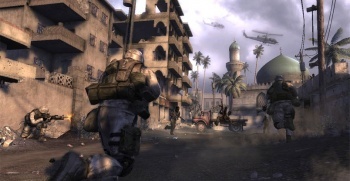 The controversial shooter Six Days in Fallujah isn't dead yet, says Atomic Games President Peter Tamte, but right now he's focusing on another, more "family friendly" project: The upcoming Marines: Modern Urban Combat for the Wii. A refresher course: Six Days in Fallujah, a "documentary wargame," was intended to be a realistic portrayal of the 2004 battle between U.S. forces and insurgents in the Iraqi city. Despite being created with the assistance of U.S. Marines who served in the campaign, however, the game triggered such outrage that Konami, the planned publisher, backed out of the deal. Since then, Atomic has struggled to find a new publisher willing to take on the game. The studio was eventually forced to lay off employees and rumors began to swirl that it was on the verge of closing its doors; Tamte, however, recently told the Marine Corps Times (via Google) that despite the cuts, the company remains committed to finding a publishing partner and getting the game out the door. In the meantime, however, Atomic's "sister" company Destineer is getting ready to launch its own military-themed shooter, called Marines: Modern Urban Combat. The game is based on a Marine Corps training system originally created by Destineer in 2005, which was later released commercially as Close Combat: First to Fight for the PC, Mac and Xbox 360. "One of our objectives with First to Fight that also carried forward to this project is to celebrate the values of the Marine Corps - honor, courage and commitment," Tamte said. "We view this more as an opportunity for the average consumer to understand more about Marines than they might get just by reading the newspaper." While Six Days in Fallujah is "visceral, emotional and authentic," Tamte described Modern Urban Combat as "family friendly." Gamers can use the Wii Zapper to simulate an M16 as they battle AK47 and RPG-wielding Syrian and Iranian insurgents who are trying to spark a civil war in Beirut. Players will lead a team that includes a gunner, assistant gunner and rifleman, and will have access to the M249 SAW and grenades. So if I'm reading this right - and by all means, correct me if I'm wrong here - a commercialized version of a Marine Corps training simulator is "family friendly" and perfectly okay, but the idea of using videogames to give adults some tiny degree of insight into the consequences of actually becoming a Marine and going off to war is completely beyond the pale. Is that it? Have I got that right? Marines: Modern Urban Combat is scheduled for release on November 10, exclusively for the Wii. Six Days in Fallujah, on the other hand, will come out about a week after Hell freezes over.